Nintendo Switch New ARMS game Can you punch your way to the top? 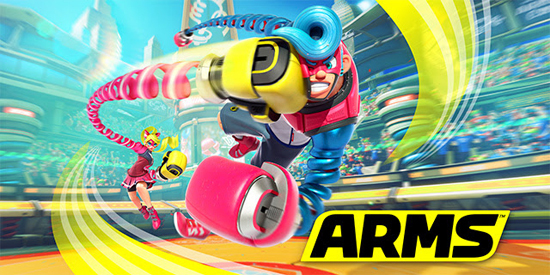 Stretch the limits of your fighting skills in ARMS, out now on Nintendo Switch. In this unique fighting game, trade blows using extendable weaponised arms, battle a colourful cast of characters and fight to claim the number one title! Choose from 10 different characters, each one brimming with personality! From the energetic Spring Man, to the light-footed Ribbon Girl, the talented movie star Twintelle, and even “The ‘Man’ of Mystery” Helix, master the unique abilities and techniques of each fighter to hold your own in battle! Customise your fighting style by equipping your fighter with weaponised fists known as ARMS. With dozens of ARMS at your disposal, and more to unlock via the ARM Getter, you can mix and match different combinations to best suit your strategies! ARMS is available to purchase directly via the Nintendo website. Additional accessories, games and/or systems may be required for multiplayer mode; sold separately. To be able to purchase download games or download demos from Nintendo eShop on the official website, you'll need to have a Nintendo Account which is linked to a Nintendo Network ID, and you'll need to have visited Nintendo eShop on the device you wish to download on at least once. For automatic download, your system must be updated and connected to the internet with automatic downloads enabled, and it must have enough storage to complete the download. To find out more, visit our Support section. Purchases made or demo downloads activated through the Nintendo website are processed via Nintendo eShop.